Mia Mingus is motivated by change. While her work extends across different areas, her passion and dedication are unwavering. 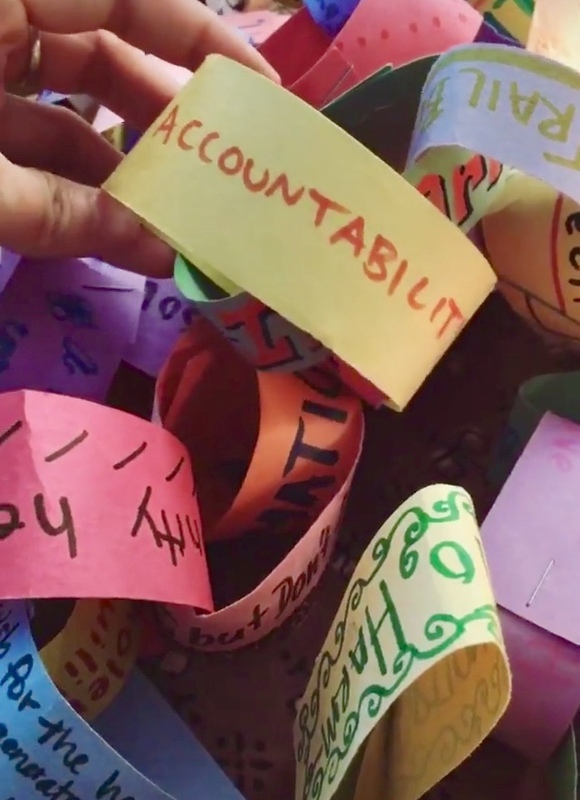 Through transformative justice, Mia fights for disability justice and fights child sexual abuse, positively impacting and creating spaces for communities, such as through the Bay Area Transformative Justice Collective. Her work may be difficult at times, but she holds an optimism that undoubtedly inspires those she is helping as well as those looking to join her. Her experience and knowledge in these issues make her honest and effective in her fight for justice. Mia holds community, whether big or small, close to her heart and it’s easy to see just how empowering those ties can be in making change. AS a writer, educator, and community organizer for disability justice and child sexual abuse and transformative justice, your identity is constantly on the frontline of your work. How do you check in on yourself? What does your self-care routine look like? A big part of my self-care routine is working hard to make sure I meet my basic needs, things such as: getting enough sleep, eating foods that nourish and nurture me, drinking enough water, breathing deeply, stretching (which greatly reduces my daily pain), doing one thing that brings me joy every day (even if it is small). It is always surprising and humbling how effective simply caring for my basic needs is to my overall wellbeing. Sometimes I think we frame “self care” as an “event.” I am going to take the whole day off to do art! But self care for me can also be watering my plants for 15 minutes in the afternoon sun, eating my favorite dessert while listening to a favorite song, taking 20 minutes to handwrite my friend a letter, doing my laundry, cooking food for myself, or taking the long way home so I can pass by one of my favorite trees. I often find that creating this foundation of caring for myself helps to remedy needing as many grand gestures of self care—though those are certainly glorious too! Cultivating a daily, hourly, weekly ethic of care for myself and my wellbeing has been much more sustainable for me, especially as a disabled person, than only holding out for grand gestures of self care scattered throughout the year. Plus, “sustainability” is one of my values and I want to be in integrity around practicing my values every day as much as I can. In terms of larger self care, I love going to the ocean. As someone who grew up surrounded by the ocean, it feels like family and I try to visit it regularly. It could just be a short drive with the ocean at my side or an entire day where I have time to get out and feel the sand on my feet. Often I will invite friends to take a drive by the coast with me. We still get to talk and catch-up, but instead of sitting on a couch, we have the coast rushing by. This is one way I check-in on myself: how long has it been since I’ve taken a drive to the coast?I grew up in a rural place, so trips to the coast also give me a chance to be in rural lands away from the city, which always helps to heal my heart from whatever chaos and trauma are happening in the world. You wrote on your blog that “We can’t be afraid to do our own work at our own tables” and yet sometimes the hardest work or conversations to have are with people within our own communities. How do you have those conversations in a loving way without exhausting yourself? For me, these conversations energize me. I get excited to have them because each time is an opportunity to practice a ton of skills and values that are important to me. I always say, you can’t practice courage unless you are afraid. And these conversations gift me the opportunity to practice what I preach in real time; to practice the values and principles that I believe in. If we want other people to be accountable, then we must practice accountability. If we want other people to “do their work with their people,” then we must do our work with our people as well. I understand all of this as a practice in loving and I am always fueled whenever I get to practice love. I practice boundaries for myself as well, of course, and I am always orienting from a place of practice, not perfection. I love to practice, learn how I can be or do better, and then practice again and learn again. I am grateful for my mistakes and messing up, because then I have the opportunity to practice coming back from my mistake, acknowledging my mess up and/or taking accountability if needed. I think about all the people who have gifted me with conversations at our “shared tables,” and that inspires me to pay it forward and to stay humble, knowing all the ways I have changed from those conversations and all the ways I will continue to change. Disability is not a monolith and as a society we lack understanding and language for it because of the toxicity of ableism. How do we go beyond recognizing and challenging our own privileges to acting on them and creating systemic change? Look up and learn about the work that is going on and join it. Reach out to organizations and figure out how to best support them in their work; how to best be part of their work in an appropriate and respectful way. People ask this question all the time: how do you move to action? And the plain and simple answer is: you just have to do it. You just have to start. And keep going. I always recommend people use their places of oppression to help them learn about their privilege, as a starting place. What action do we want from folks who benefit from our oppression and how can we use this to help us begin our work in the places we have privilege. What is a fun fact that people need to know about you? I love cake. I love good cake with little-to-no frosting on it and I don’t understand why this is so hard to find in this world? Whenever I travel somewhere, I always seek out local bakeries. PS: Good cake should not need frosting to make it delicious. Frosting should enhance an already delectable cake. Too many people use frosting to cover-up and distract from sub-par cake. I feel most empowered when I am practicing courage. And I try and practice courage every single day. Oppressed communities have had and continue to have a complicated relationship with the health care system that leads us to distrust our providers, insurances, and medication. What is the Medical Industrial Complex and what steps as individuals can we take to regain autonomy over our own health and lives? Transforming the MIC and creating alternatives to it is one of the many things need to do to “regain autonomy over our own health and lives.” This is also a great example of the kind of systemic change I was referring to in one of your previous questions. If we can imagine the kind of work we would need to do to be able to go up against the MIC and the things we would need to build in order for our communities to be able to access care that they trust and know will not only care for themselves, but also for the planet and generations to come. There are so, so many things people can do and so many different roles to play in this work. Here are just a few examples. Work to create alternatives to the MIC: support healers and practitioners outside of the MIC, create community care networks, make sure people in your neighborhood can access healing and wellness services if the need them. Work to change the MIC itself: fight for more accountability within the MIC (e.g. when doctors abuse their patients), work to change laws and policies that affect healthcare, fight for universal healthcare, talk with and organize providers to shift the ableist, sizeist, racist or transphobic beliefs that exist within the MIC. You can also work directly to help people get the medical services they need: help folks get their medications and get access to insurance, get trained yourself so that you can provide medical care to folks who need it, create networks of providers who are willing to see folks pro-bono or build underground networks of providers who will see patients who don’t have health insurance. As a seasoned community organizer, how do you center and uplift the experiences of folxs within your membership? What is your theory of change or the practices you lead with? Everything we do is grounded in the experiences of the transformative justice community we are cultivating for this work. Whenever we are gathering to meet or to learn, we are always asking people to use their experiences in their life to learn from and share with others. Because transformative justice work straddles binary of personal and political, we must do the work we want to see out in the world in our own lives first. One mantra I lead with is: practice yields the sharpest analysis. We learn by doing and we want to be in integrity with our work. We can’t just talk about transformative justice, we must practice it. Practice is how we will learn the best and the most effectively. If we want other people to practice accountability, then we must practice accountability. If we want survivors to have support in our communities, then we must start by building that in our own relationships, networks and families. I also lead with: local is first, local is best. We must build locally. Many of us have people we love and trust who love far away from us, but we must also have people in our neighborhood, city, town who can show up for us when violence, harm or emergency happens. What good is talking about keeping children safe at national conferences, if we don’t know what to do when a child is in danger in our lives? If we can’t even practice accountability and justice between each other, then how can we demand accountability from institutions or the state? All of our work must be grounded in actual concrete practice and one of the only places we can do that is locally, in our relationships, in our families, in our communities. How do you confront and challenge oppressive dynamics while building community with others? In the BATJC, one of our practices (link to: https://batjc.wordpress.com/batjc-values-principles-practices/) is “challenging oppressive dynamics in the service of connection and trust.” It invites us to understand challenging oppressive dynamics as a potential opportunity to deepen relationship and trust. It also invites us to understand that there can be no true connection and trust withoutacknowledging and confronting oppressive dynamics. When you are building community with others, you are engaging in the work of building connection, relationship and trust together. You must be able to address oppressive dynamics in a way that gets you closer to your long term goal of community. Conflict is one of the best ways to build and deepen trust, though we rarely understand it as such. More often than not, we only recognize conflict as something that can break trust. However, if change the way we orient to addressing conflict, then we can re-orient our actions. What if we saw the opportunity in addressing hard things such as oppressive dynamics? What if we were excited and motivated by the prospect of tackling something so necessary, in a way that could bring us closer together and expand our understanding of one another and the world we live in? What if we all invested in building the skills needed to do this? Skills such as active listening, self reflection, accountable sharing, giving and receiving feed back, learning about our places of privilege, taking accountability (which includes apologizing and changing your harmful and hurtful behaviors), prioritizing and investing in our own healing work, emotional intelligence and emotional labor, proactively building support in our lives around addressing our places of oppression and addressing our places of privilege. I think we must start to understand that confronting and challenging oppressive dynamics is a necessary part of building community with each other.Once we can do this, then it will necessitate a shift in how we address oppression and oppressive dynamics. Hopefully this will change some common pitfalls such as the people who are oppressed always having to bring up oppression and privilege in a space, or those who hold privilege not even knowing how to fully engage in a conversation about their privilege and operating from a place f guilt and shame, rather than a place of love and solidarity. For our readers who not familiar with the Bay Area Transformative Justice Collective (BATJC), please share with us how you got started and what your collective aims to transform through the POD model. What are some experiences you hold close to your heart and what recommendations would you share with other communities interested in adopting a similar model in their grassroots organizing efforts? The BATJC is 5 years old and we started out as a small group of folks who wanted to build transformative justice responses to child sexual abuse. We are now a vibrant collective that is growing faster than we can keep up with. We are still pretty small in our inner workings (our entire group is held down by 3 core members), but we have a circle of folks about 20 large who make up our planning and organizing teams, and then a larger circle with hundreds of people who support our work, attend our events and make up our ever-growing BATJC community. One of the main things we hope to do through our Pod model (https://batjc.wordpress.com/pods-and-pod-mapping-worksheet/), is to get people to build some of the conditions necessary for TJ in their everyday lives. We hope people will build their pods and deepen and expand them. We hope people will build pods for their children too. Building your pod(s) is a concrete step you can take towards building TJ in your life. It is exciting and heart warming to see people building and growing their pods. Some pods meet regularly as a group and some pods meet up with other pods. Every time we hold an event, we encourage people to attend with their pod people, so that everyone is getting the information and resources; that they will be that much more prepared when violence happens and to be able to prevent violence. When we organize our Transformative Justice Studies, we prioritize people who register with their pod. This past TJ Study was filled with pods and you could see the effectiveness in real time. For other folks interested in doing similar things, we happily share our pod model and encourage folks to adapt it or evolve it as needed. We know that different places, communities and work will require different strategies and tools and we are excited to learn from other groups how they are using pods or adapting it or creating their own models. Our model of pods has been useful for us because it helped to make transformative justice more accessible and more concrete to our communities. It helped make transformative justice work something that everyone could do right now in their everyday lives—which is not to undermine at all how challenging pod work is. At the crux of building pods is simply building relationships, which is at the core of transformative justice. Because if we are not going to rely on the state, then we will need to rely on each other and that will require that we have solid relationships with one another. How can we continue to support you and work? I would ask people to support the BATJC. You can make donations through our website and you can also make in-kind donations by donating space for our events, food or other resources. You can join our email list or follow us on social media. For me personally, you can follow me on Instagram, which is about the only social media I use these days, and you can follow my blog, which is where I continue to post my writings. There is a donation link on my blog and often people will make donations when they use my work for their courses or workshops. I have put most of my work out for free because it is what I wished I had had when I was younger, so I appreciate any and all support people feel moved to offer. Photographs and videos provided by Mia Mingus.